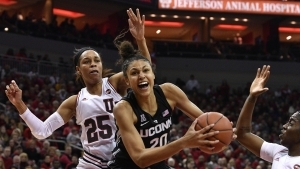 There’s one team that could’ve made a strong case for the last 1-seed instead of Mississippi State, and that’s UConn.  No. 8/7 #muwbb cruises past Villanova, 93-55 earning it’s 12th straight victory on Sunday. The next set of top 16 rankings will be revealed Monday, March 4 at halftime of ESPN2’s broadcast of UConn vs. USF. The 64-team 2019 NCAA tournament field will then be unveiled two weeks later on Monday, March 18.